Light weaponry is being removed from the front lines in eastern Ukraine, indicating that de-escalation measures have begun. The withdrawal of weaponry is accompanied by political measures in accordance with the Minsk peace agreement signed in February. There is rising hope that the cease-fire between Ukrainian government forces and pro-Russian rebels in the Donbass region of east Ukraine could be headed toward a lasting peace, with both sides beginning to withdraw their weapons from the front lines of conflict. The self-proclaimed Lugansk People's Republic (LNR), one of two breakaway entities in the Donbass, confirmed the withdrawal of weapons below 100mm calibre by the Ukrainian military on October 5. 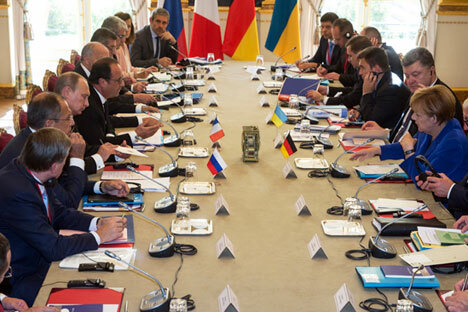 The LNR began removing their light weapons from October 3, after an agreement was arrived at during a summit meeting of leaders from France, Germany, Russia and Ukraine in Paris on October 2. The summit primarily emphasized that there were no options available to the conflicting sides other than implementation of the Minsk peace agreements. At Paris, the need for both conflicting parties to make concessions, particularly concerning forthcoming local elections, was emphasized. The Donbass region plans to hold local polls separately from Ukrainian general elections (due to take place on Oct. 25). The Paris summiteers advised the self-proclaimed DNR (Donetsk People's Republic) and LNR to review their plans and to conduct elections in accordance with Ukrainian law. Kiev was advised to adopt special legislation on elections in the Donbass, in consultation with the leadership of the breakaway regions, pass a constitutional amendment to allow special status for the Donbass, and grant amnesty to all combatants. Are Kiev and the pro-Russia rebels willing to implement these arrangements, which only confirm, again, the necessity of the Minsk agreements? Russian analysts say the Ukrainian authorities need to decide because it is easier for the DNR and LNR to organize their elections in a timely and effective manner. "It is easier for the Donbass to fulfill the political part of the agreements, including the rescheduling of the elections, than for Kiev. For Kiev, it is a question of stability of the political regime, the internal stability of the country," said Maxim Bratevsky from the Centre for European Studies at Moscow’s Higher School of Economics. Yevgeny Minchenko, head of the International Institute of Political Expertise, said a compromise over elections is absolutely possible. In the Donbass, elections can be held in single-mandate constituencies, rather than with the participation of Ukrainian and regional political parties. Is the West’s support for Poroshenko waning? According to Russian analysts, Kiev, represented by Ukraine’s President Petro Poroshenko, does not have much room for manoeuvre on the situation in the Donbass. "There is an assumption that Poroshenko failed to receive 100-percent support from [his] Western partners [at the meeting in Paris]. Apparently, it was pointed out to him that breaking the Minsk agreements into parts ..and implementing some agreements while not implementing the others, without engaging in the political process, will not work," said Bratevsky. According to Minchenko, "from unconditional support for Poroshenko, they [Europeans] have moved toward a rather critical perception and to the [understanding] that they should put pressure on him so that he fulfil his promises." The analyst attributed this "major change" in Europe's position to "objective reasons": "The man [Poroshenko] always promises, but does not do anything." Ukrainian analyst Andriy Yermolayev, director of the New Ukraine Institute for Strategic Studies, agrees that unconditional support for Poroshenko is declining. He said Europe was forcing Poroshenko to act "even at the cost of significant perturbations in Ukraine itself." According to him, implementing the Paris plan could lead to a "more or less sustainable cease-fire and a decrease in the physical presence of Russia in the Donbass." However, this does not remove the process of the further “autonomization” of the Donbass from the agenda. "Not all members of the current ruling coalition are interested in the peace process, even if difficult and painful – there is a "party of war" and there are supporters of a "smaller Ukraine" (Ukraine without the Donbass)," said Yermolayev. "The president himself – who, unfortunately, does not show consistency or have a clear platform on the issue of the Donbass – is in a difficult position." But despite these problems reaching a peaceful settlement, Yermolayev believes – just like his Russian counterparts – that despite all this, a resumption of hostilities in eastern Ukraine is still not to be expected.